The Birmingham-Shuttlesworth International Airport (BHM/KBHM) (formerly Birmingham Municipal Airport and Birmingham International Airport) is the major airport serving Birmingham and Central Alabama. It is located four miles northeast of downtown Birmingham, near the interchange of I-20 and I-59. The airport serves approximately 3.2 million passengers annually, and is the largest and busiest airport in the state, offering 80 daily departures to 25 cities nonstop and 35 cities direct. The airport is served by the nation's three main "legacy" carriers: American Airlines, United Airlines, and Delta Airlines, as well as by the well-established low-cost carrier Southwest Airlines. Since 1986 the airport's operations and facilities have been overseen by the Birmingham Airport Authority. Al Denson served as president and CEO from 2000 to 2018. Currently Sylvester Lavender holds those positions on an interim basis. 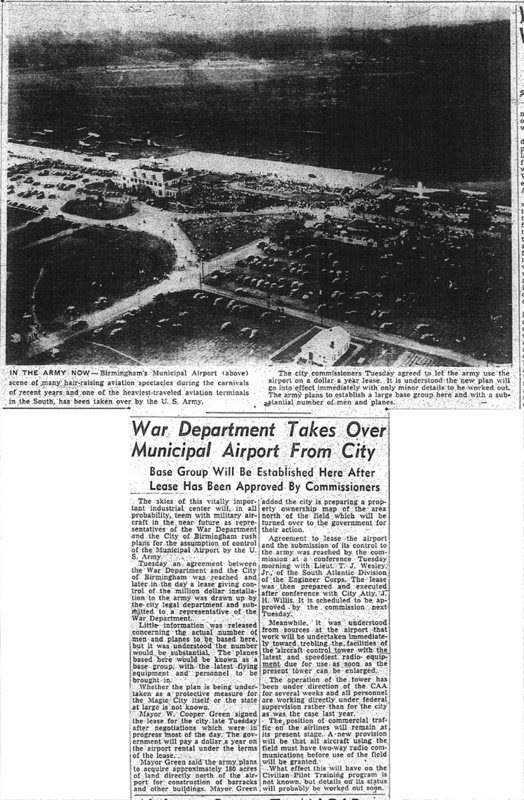 Before the Municipal Airport opened, Birmingham's commercial aviation activity utilized the Alabama National Guard's Roberts Field in Ensley, while private flyers trained at Glenn Messer's Messer Field in Central Park. Famed aviator Charles Lindbergh landed at Messer Field on October 5, 1927 during his 22,000-mile national tour sponsored by the Daniel Guggenheim Fund for the Promotion of Aeronautics. Lindbergh spoke on the importance of joining cities together with improved aviation infrastructure and secured pledges from local officials to pursue construction of a major airport. Two years later, American Airways passed on adding a Birmingham stop due to insufficient runway for their Ford Tri-Motor planes, adding impetus for the development. On May 31, 1931, the $1 million Birmingham Airport, a two-story Georgian-style brick terminal surrounded by open fields and a single runway, opened with day-long ceremonies and an air show. Hundreds came to witness the return of commercial passenger service to the city with a stop by American Airways along its Atlanta, Georgia to Fort Worth, Texas route. With additional service from Eastern Airlines in 1934 a second runway was added. During World War II the entire airport was leased to the United States Department of War. The lease, signed in February 1942, turned the property over to the Army Air Corps for $1 a year. The Corps improved the facility by acquiring land, paving more taxiways, constructing an air traffic control tower, and building a complex of aircraft modification buildings, later sold to the Hayes International Corporation, a major employer which continued to work on military contracts after the war. In August 1948 the Air Corp's lease was terminated and the facility returned to the city's control. Southern Airways and Capitol Airways began servicing the airport and runway 6/24 was extended to 10,000 feet to serve larger craft. When Capitol merged with United Air Lines, the first jet planes began landing at Birmingham. A new 87-foot-tall air traffic control tower was constructed in 1962 and went into service in 1964. The present two-story terminal building was completed in 1973, with a total of 15 aircraft gates and a 1,600-space parking deck. In 1976 the newly-completed terminal was given the name Seibels/Bryan Airport Terminal Building to honor mayor George Seibels and city councilman John E. Bryan. A large sign reading "BIRMINGHAM" was installed on the terminal, facing the runways. In June 1986 the Birmingham Airport Authority was created by the Birmingham City Council. At the time, the Birmingham Airport offered 38 daily departures. By December 1987, 43 cities could be reached by non-stop and/or direct service from one of eight airlines (American, Eastern, Piedmont, Northwest, USAir, Delta, Southwest and United). By October 1988, the Birmingham Airport offered 65 daily departures and served 1.9 million passengers. In 1993, as the airport marked the completion of a major terminal renovation, flights were up to 77 departures per day, serving nearly 2.1 million passengers that year. Direct service was added to destinations in Mexico and Canada and on October 20, 1993 the name was officially changed to Birmingham International Airport. By 2000 air traffic was up to 81 daily departures with non-stop service to 28 cities and direct flights to 48 cities. That year a new 211-foot-tall brick-clad air traffic control tower was constructed at the south end of the terminal building and was placed into service in March 2001. The 1962 tower was demolished in 2004 by Tomlin Excavating of Tarrant. The cab of the tower was salvaged and utilized as part of an exhibit at the Southern Museum of Flight. In 2005, the number of passengers rebounded from the effect of the 2001 terrorist attacks to once again cross the 3 million mark. In 2006, Birmingham International Airport celebrated its 75th year of serving the central Alabama region. An extension of runway 6/24 to 12,002 feet gives Birmingham International Airport the capacity to serve fully-loaded Boeing 747s. In 2008 Birmingham mayor Larry Langford proposed renaming the airport Birmingham Shuttlesworth International Airport to honor Civil Rights leader Fred Shuttlesworth. The proposal was received favorably by the Airport Authority, which voted to make the change on July 16, 2008. It was later approved by the Federal Aviation Administration. The runway was expanded in 1956 with new approach lights which extended into the Beechwood subdivision of the Inglenook neighborhood. Residents protested the expansion, calling the runway a "nuisance" and calling for the city to purchase their homes before extending the runway. A new terminal was completed in 1962, along with a new air traffic control tower two years later. A major terminal expansion was completed in 1993. The $50.4 million project involved the construction of a new two-level roadway for arrivals and departures and a complete refurbishment of existing terminal spaces. KPS Group created the design, with a steel canopy over roadway which bends around the semi-circular terminal and with new vaulted skylights and lofty interiors, including a new centralized baggage claim area. A 2,000 foot expansion to runway 6-24 was dedicated on July 23, 2007 after five years of work, making the runway 12,000 feet in length. The extension now provides enough runway length for a fully-loaded and fueled Boeing 747 to land or take off in Birmingham. In 2008 the airport completed a $20 million Air Cargo Complex expansion and also resurfaced the Air Carrier Apron area. That same year, officials announced a new "Terminal Modernization Project" to include adding another concourse and baggage screening area, with the possibility of accommodating a United States Customs inspection station. The airport parking deck would be cleaned and refurbished with new covered crossings to the terminal. The project began in January 2011 and was completed in June 2014 at a cost of $201.6 million. The expansion was designed by KPS Group and aimed toward qualifying for "silver" status under the Leadership in Energy and Environmental Design (LEED) program of the U. S. Green Building Council. Sustainability features of the project included enhanced daylighting with computer-controlled low-power supplemental lighting in public areas, a rainwater harvesting system for toilets and irrigation, solar-heated water in restrooms, and recyclable construction materials. The Birmingham Civil Rights Institute installed an exhibit about airport namesake Fred Shuttlesworth. A new "BIRMINGHAM" sign, 72 feet long and 13 feet tall, was fabricated by Fravert Services and installed in 2015. A "sensory room" was added to Concourse B in 2019, providing a calm space for the benefit of individuals with autism, PTSD, dementia or other conditions that can make time spent in airports overwhelming experiences. The Vestavia Hills-based nonprofit KultureCity helped to plan and develop the space. Birmingham-Shuttlesworth International Airport is Alabama's busiest commercial air passenger facility. It is served by Delta Airlines (and its Delta Connection affiliates), Southwest Airlines, American Airlines' American Eagle affiliates, United Airlines' United Express affiliates, Frontier Airlines (since 2018) and ViaAir (beginning in 2019). The airport accommodated more than 2.9 million commercial passengers in 2018. Before the 2014 modernization project, the airport used two concourses, named B and C. "Terminal A" referred then to the 1962 Birmingham Airport terminal building, which was used as office space. That building was demolished in 2011. Currently, the airport has three terminal concourses with a total of 19 gates for passenger arrivals and departures. Concourse A, with eight gates, is used primarily by Delta Airlines. Concourse B, with five gates, is used primarily by American Airlines. Concourse C, with six gates, is used primarily by Southwest and United Airlines. Concourse A includes a removable partition which can be used channel passengers arriving from outside the country to a U.S. Customs and Immigration facility on the ground floor. The single largest source of revenue for the Birmingham Airport Authority is parking fees. The authority operates a 7-story, 5,600-space parking deck for long and short-term parking as well as a 900-space satellite lot with shuttle service to the terminal. Another small "cell phone lot" is used by people waiting to pick up arriving passengers. In January 2008 the Authority voted to increase long-term parking fees from $8 to $10 per day beginning February 1. The increase was expected to add $2 million in annual revenue. The daily parking rate was last raised on April 1, 2002 from $7 to $8. Short term parking is $1 per hour. No general carrier crashes have occurred at the Birmingham International Airport. Two fatal incidents involving smaller commercial craft have taken place. The most significant occurred on July 10, 1991 when L'Express Airlines Flight 508 crashed, killing 13. Eight other fatal incidents involving private or military craft have occurred at the airport since 1962. On August 14, 2013 a UPS cargo jet crashed in cleared land in the Airport Highlands neighborhood north of the airport, killing the pilot and co-pilot. On March 31, 1971 14-year-old John Matthews attempted to hijack a Delta Airlines flight from the Birmingham Airport. He brought a pistol on board the flight and demanded, before take-off, that the pilot take the plane to Cuba. Houston-based flight attendant Marilyn Jordan convinced him to surrender, and later convinced Delta to fund his defense. Jordan and her husband were granted custody of Matthews for the summer during his parole. A fatal non-aviation incident occurred on March 22, 2013 when a flight information display cabinet in the newly-renovated terminal fell over, killing a 10-year-old boy and injuring his mother and siblings. The airfield is capable of handling all aircraft types. The main Runway 6/24 is 12,000 feet long. The secondary Runway 18/36 is 7,100 feet long. A Category II instrument landing system allows operations in visibility as low as a quarter mile. The Air National Guard has a base which includes a wing of KC-135R air tankers. In the past, the air guard unit operated reconnaissance aircraft. There is also an aviation support facility for the Army National Guard. A large aircraft modification facility, originally built as the Betchel-McCone-Parsons Airplane Modification Plant for refitting B-34 and B-29 bombers during World War II, is presently operated by Alabama Aircraft Industries. There are also two fixed base operators and numerous corporate hangars. This page was last modified on 15 February 2019, at 16:02.